Pure Genius™ marine phytoplankton is a raw, enzyme active, single strain, single celled micro-organism, rich in Omega essential fatty acids including Omega-3 EPA / ALA / DHA / DPA plus the rare Omega-7, amino acids (complete protein), pigments, minerals, vitamins, chlorophyll and antioxidants. Pure Genius™ marine phytoplankton is grown in a protected inland location that has exclusive access to a unique underground source of mineral rich, ancient sea water. All naturally occurring phytochemicals are preserved after harvesting. In other words, all identifiable nutrients that are present in living algae are retained - nothing is altered or taken away. The dried algae biomass is then micronised to a fine powder and packaged in light proof, air tight containers to enable a three year shelf life while unopened. You can purchase Pure Genius™ Marine Phytoplankton in convenient air-tight packs of vegan/veggie capsules or loose powder. If you choose the powder option, then we highly recommend that you mix it with bottled or filtered water (not tap water as it may contain fluoride and chlorine). Using a drinks bottle, add the water first, then the powder, secure the lid tightly and shake a few times. The powder easily disperses in the water... add a little Organic fruit or veggie juice if required (although the taste is very mild), then slowly sip the contents during the day for maximum benefit. Gram for gram, we don't believe there is any other single-source whole food that compares to Pure Genius™ Marine Phytoplankton. Some experts are even describing this unique micro-algae as ‘Nature’s Holy Grail’, perhaps they’re right? Pure Genius™ 100% Nannochloropsis gaditana phytoplankton low temperature air-dried powder (and veggie capsules) is free from: GMO/GE, Dairy products, Animal products, Fish, Gluten, Wheat, Grains, Seeds, Nuts, Tree Nuts, Preservatives, Additives, Fillers, Soy, Heavy Metals (below detectable levels), Excipients/Flowing Agents and is considered suitable for all diets including Vegans, Vegetarians, Coeliacs, Diabetics and Low Sodium. A complete analysis is included with every new order. For very young children who are not yet eating solid food, we suggest you consult a Doctor or qualified health practitioner before use. If you are pregnant or nursing, always seek guidance from a health professional if in doubt. A WORLD FIRST: DELAYED RELEASE VEGAN CAPSULES! Pure Genius™ DNA Verified Nannochloropsis gaditana marine phytoplankton is now available in Delayed Release (DR) capsules. No other company that we know of produces Nannochloropsis gaditana micro-algae in Delayed Release vegan/vegetarian capsules as standard. 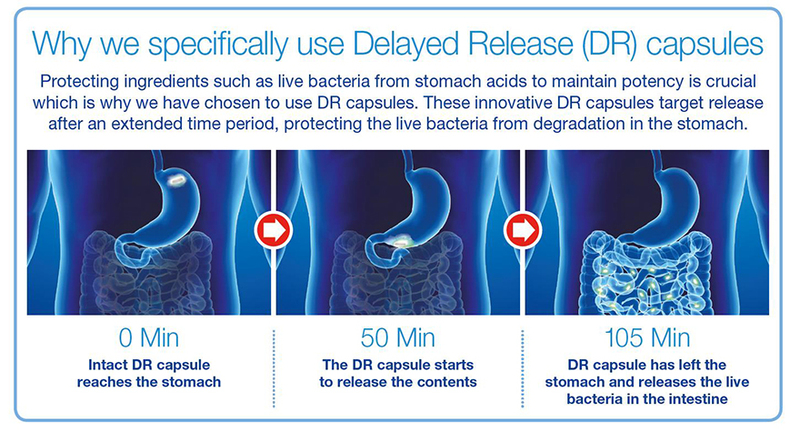 Do not confuse Delayed Release technology with Enteric Coated pills that are produced by drug companies specifically to protect medicines & supplements from being degraded by stomach acid. The outer Enteric coating is manufactured using synthetic chemicals that are known to cause digestive discomfort and other negative side effects. In contrast, our Delayed Release capsules are made from safe, natural plant sourced material and are clinically proven to retain the integrity of all active phytonutrients contained within the micro-algae while travelling through the stomach. In particular, enzymes, vitamins, amino acids (proteins), Omega fatty acids and other important lipids are easily degraded when making contact with low pH gastric acid in the stomach which can vary between 1 and 3 on the pH scale. In addition to these variations in pH, some people produce too little stomach acid while others produce too much! ... We avoid this issue completely because our Delayed Release capsules resist gastric acid and remain intact on their journey through the stomach. Only when they arrive at the more alkaline environment of the small intestine - between 6pH and 7pH - will the capsules completely disintegrate, releasing their contents. This means that you are likely to experience significantly greater benefit of the micro-algae at a cellular level compared to conventional veggie caps that disintegrate in the stomach. It is important to remember that humans digest & assimilate around 90% of food in the small intestine and only 10% in the stomach. Delayed Release (DR) technology replaces traditional Enteric Coated supplements and medicines that often cause negative side effects. The above illustration describes the journey of a DR capsule when swallowed by the subject. Primal Food Store supplies the following supplements exclusively in Delayed Release vegan/vegetarian capsules: Nannochloropsis gaditana marine phytoplankton | Ashwaghanda | Fermented Turmeric | Fermented Kale and whole food formulations containing live/viable bacteria (probiotics). We recommend that Delayed Release supplements be taken with at least 500m/litres (or large glass) of clean, chlorine free water. Always consume on an empty stomach and NOT within 2 hours of eating a solid or liquidised meal (e.g. smoothie).